The Palestinian government has lambasted an upcoming conference in Poland on the Middle East as an 'American conspiracy,' saying Washington seeks to lure participants into adopting US views on the Palestinian cause. Palestinian officials will not attend next week's U.S. conference hosted by Poland, chief Palestinian negotiator Saeb Erekat said on Friday after a U.S. official said they had been invited." 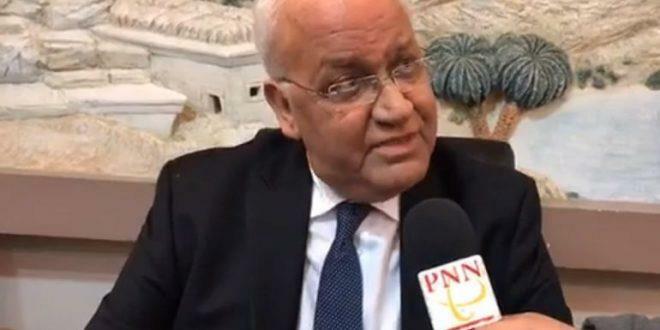 Regarding statements that we have been invited, we can say that only today there was some contact from the Polish side," Erekat said on Twitter. "Our position remains clear: We are not going to attend this conference and reiterate that we have not mandated anyone to talk on behalf of Palestine." The international gathering will take place in the Polish capital Warsaw from February 13 to 14, the US State Department announced last month, with American Secretary of State Mike Pompeo claiming at the time that the gathering would focus on 'stability and peace, freedom and security' in the Middle East. Ties between the US and the Palestinian Authority took an unprecedented dip in late 2017, when Washington recognized Jerusalem al-Quds as Israel's 'capital'. Israeli Prime Minister Benjamin Netanyahu, US President Donald Trump's senior advisers Jared Kushner and Jason Greenblatt and Pompeo, are among those who are expected to attend the meeting. The Palestinian foreign ministry's statement further stressed that the Palestinians would ignore all conclusions of the conference, criticizing the American president for hailing the US embassy move in his State of the Union address on Tuesday. 'The malicious intentions of this administration were reiterated by US President Donald Trump in his State of the Union speech to Congress in which he stressed continuing with the policy of absolute bias toward Israel,' the statement further said, adding that the incumbent US government has 'declared war' on the Palestinian issue from day one.